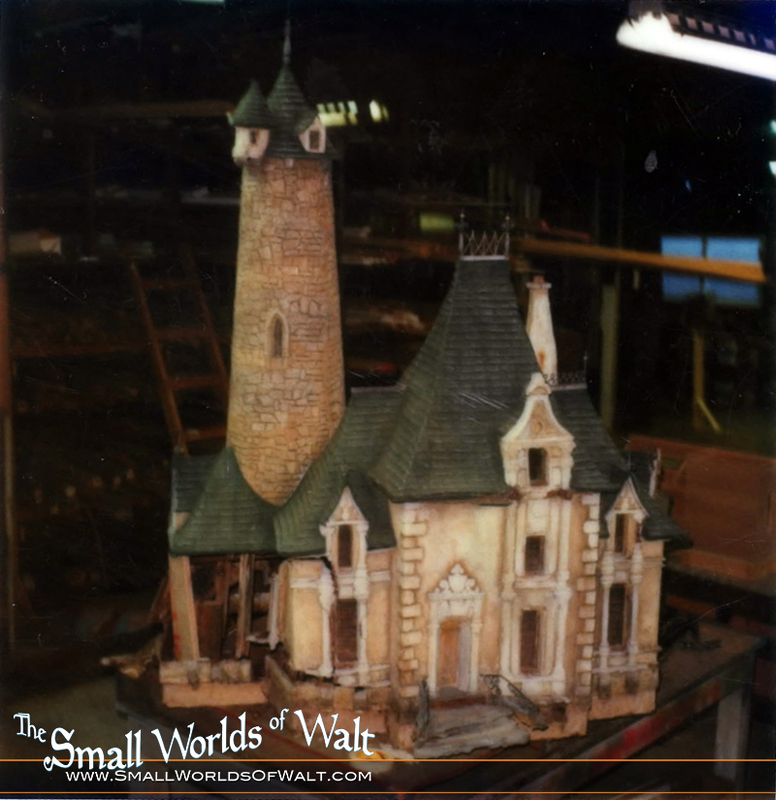 Carolwood Foundation – Small Worlds of Walt - A restoration chronicle for a new exhibit at Walt's Barn in Griffith park. Removed and replaced in 1981, the village is now in desperate need of preservation. Published on June 16, 2016,	by Rob Fendler in Featured, Storybook Land. 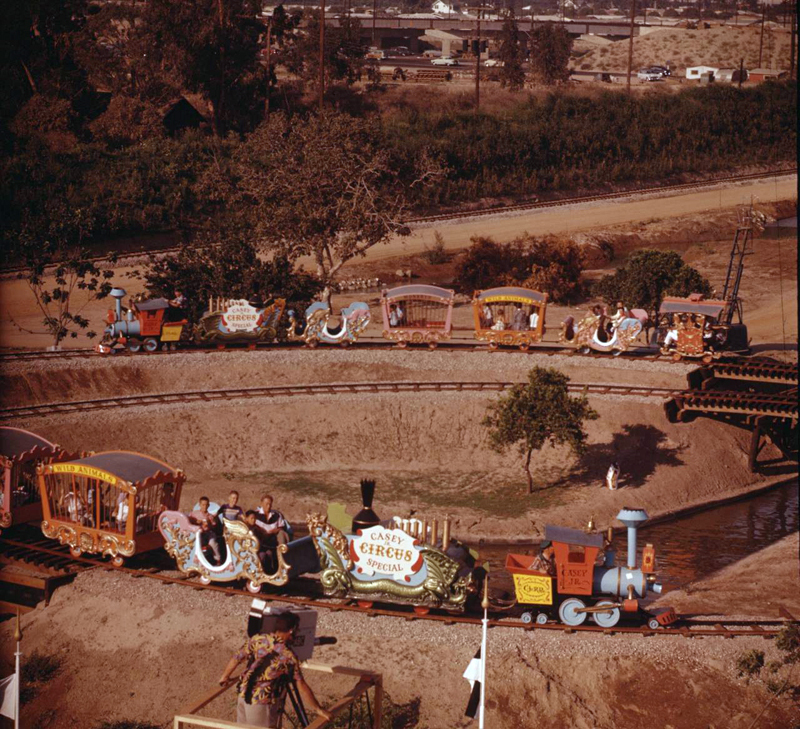 And so, sixty years ago today, the infamous muddy bank ride known as the Canal Boats of the World reopened as the Storybook Land Canal Boats on the Saturday just before Father’s Day. It wasn’t until two days later, on Monday, the 18th, that the opening ceremony took place which was attended by Mouseketeers Darlene, Lonnie, Sharon, and Bobby as well as the The American Dairy Princess who christened the boats with a bottle of milk. 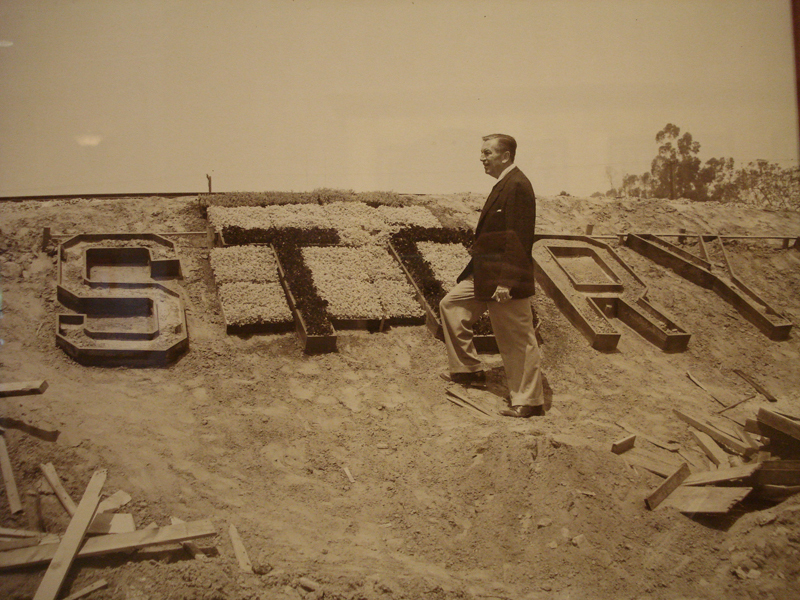 On July 17th 1955, Disneyland’s opening day, Storybook Land was nothing more than muddy dirt berms. As progress continues on the restoration of the only surviving piece of Walt’s original Storybook Land, its nice to know that the attraction itself has finally reached its Diamond Anniversary along with the rest of the park. Happy Birthday Storybook Land! Published on January 14, 2016,	by Rob Fendler in Restoration Progress. With all the woodwork finished its time to get painting! 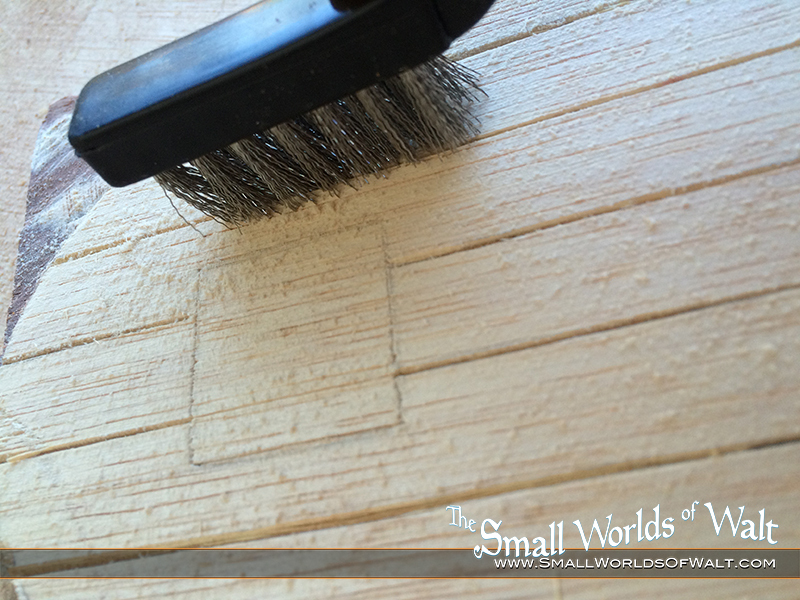 A coat of primer first to seal the wood and keep the paint for seeping into the wood in weird and unexpected ways. 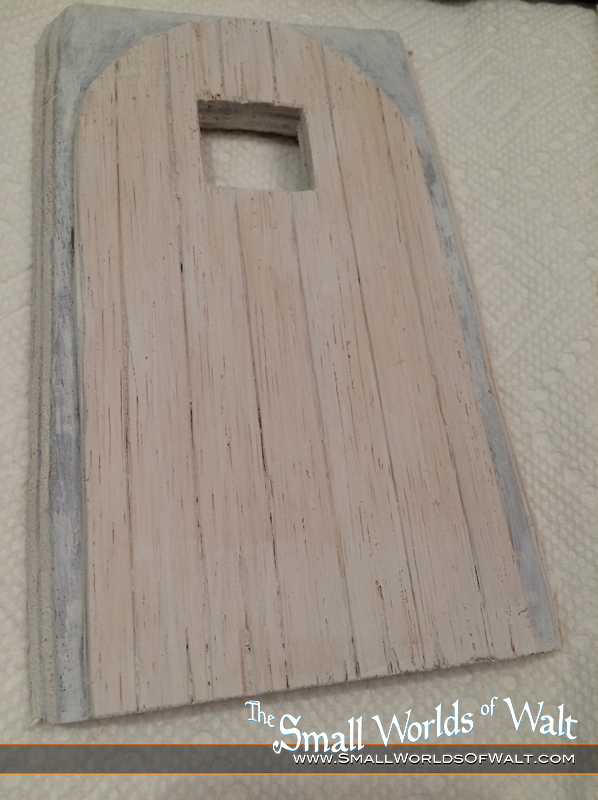 The base coat of paint is applied first to get the basic colors down and the overall look of the door. A second pass to add detail and weathering. 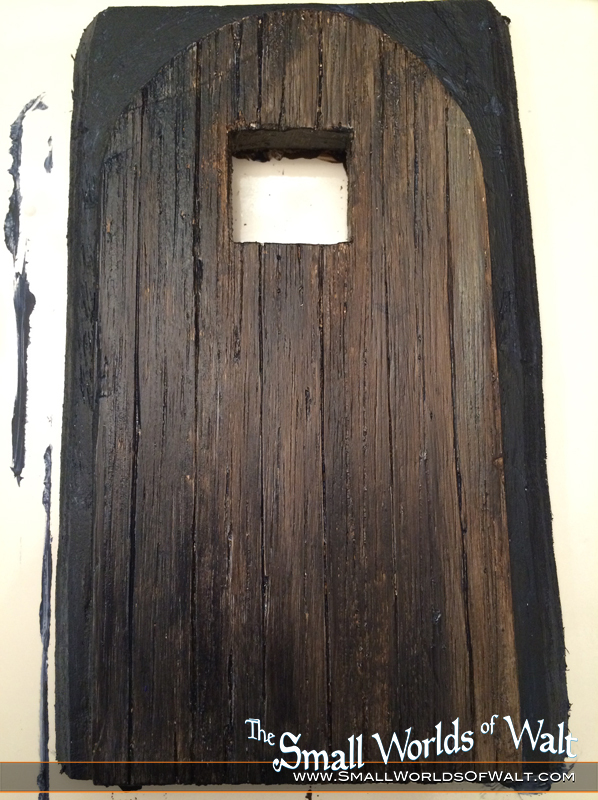 Dark grey and blacks are worked into the grain of the wood and the contours of the door. You can’t simply paint it brown and call it a day. This door needs to look like it was made hundreds of years ago and was used by the guards entering the tower for generations. 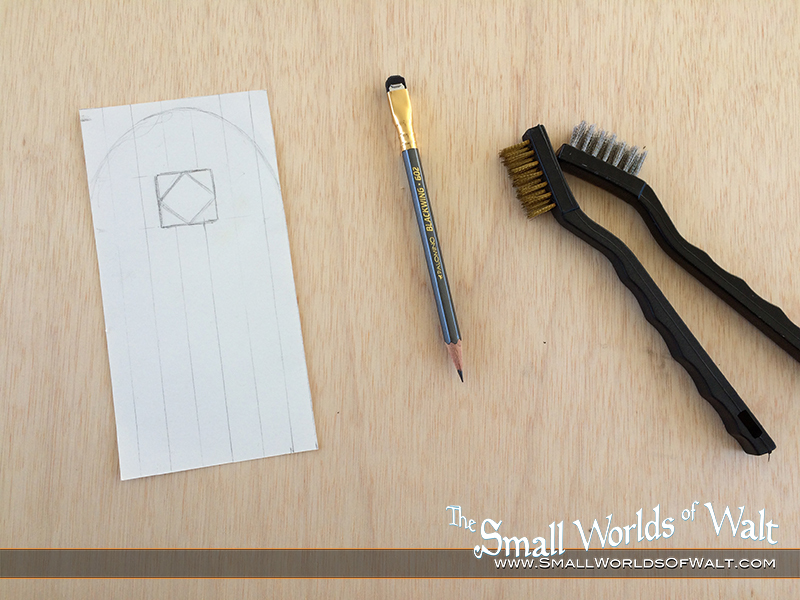 Miniature hardware has been added, which really brings character to the door. Sticking is also added to the window which will eventually separate the panes of glass. 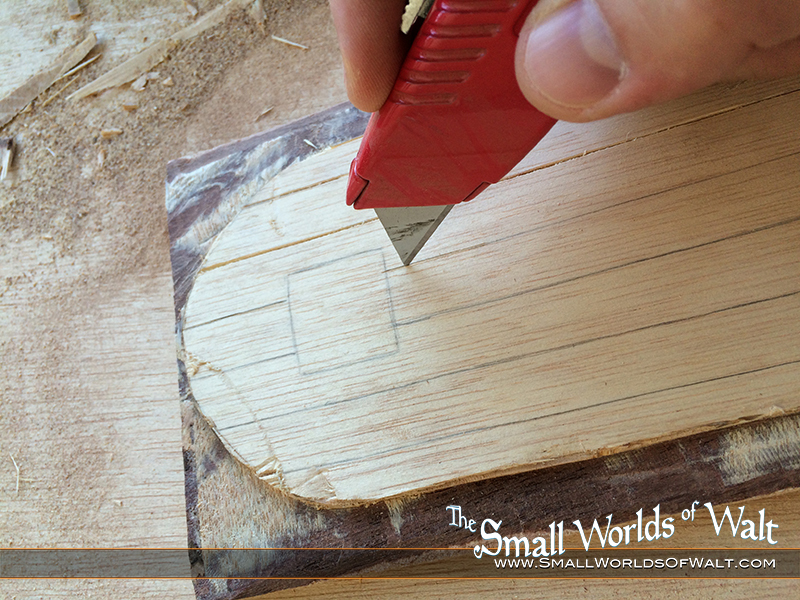 These tiny pieces are pre-made for 1″ scale doll houses and have a really nice weathered look to them. 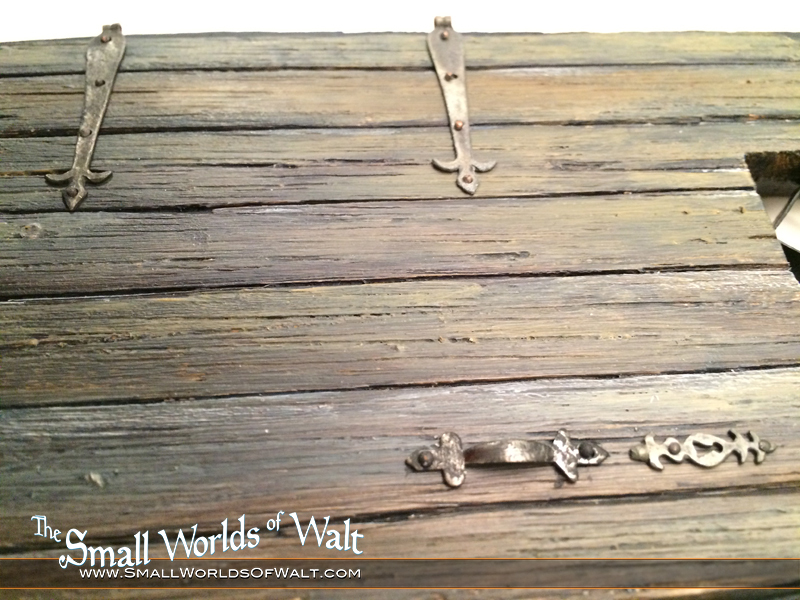 They even came with tiny nails that had to be carefully hammered into the door to secure them! 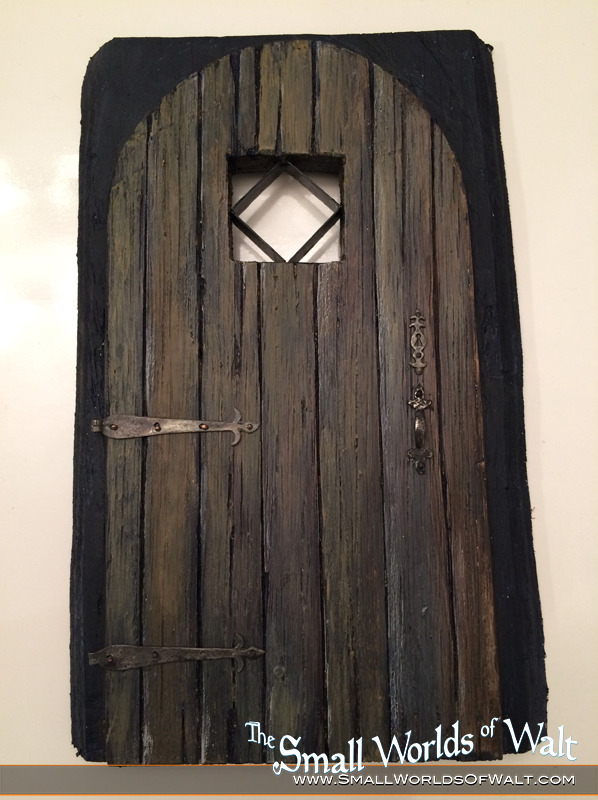 Almost done with the door. 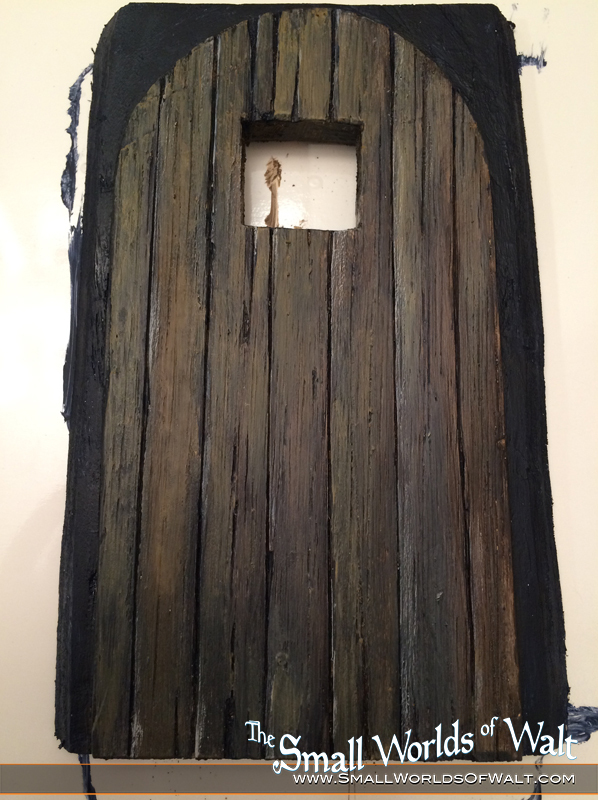 Next up is pouring the resin for the window and hanging it in its tiny door jamb. Published on August 13, 2015,	by Rob Fendler in Restoration Progress. The Tower Gate immediately after removal from its foundation. When we received the Tower Gate, the last building on path up to Cinderella’s castle, the small door on the left was missing entirely. I thought this would be a great first piece to replace to test some techniques on a spot that would be fairly hidden in the final village. The door, which is tucked away under a covered walkway that connects the tower the rest of the French Village, is a small detail that could be easily remade. With only this photo to go off of, I could tell that the original had a nice little square window, which would give a nice little light in the darkness of the walkway. 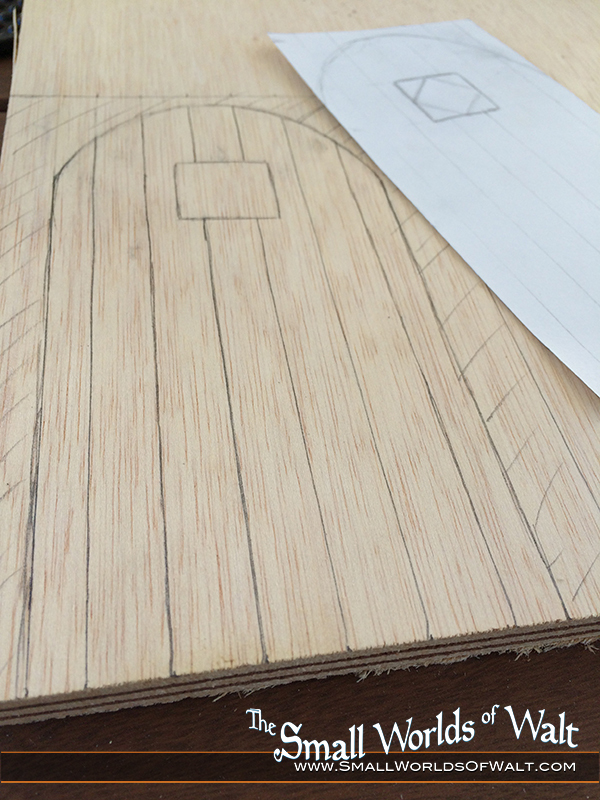 The door is first sketched out at the right size which will be used as a template for the final door. The sketch is transferred to plywood with a margin around the perimeter so that light doesn’t leak around the edges of the door. This will also make mounting the door easier. 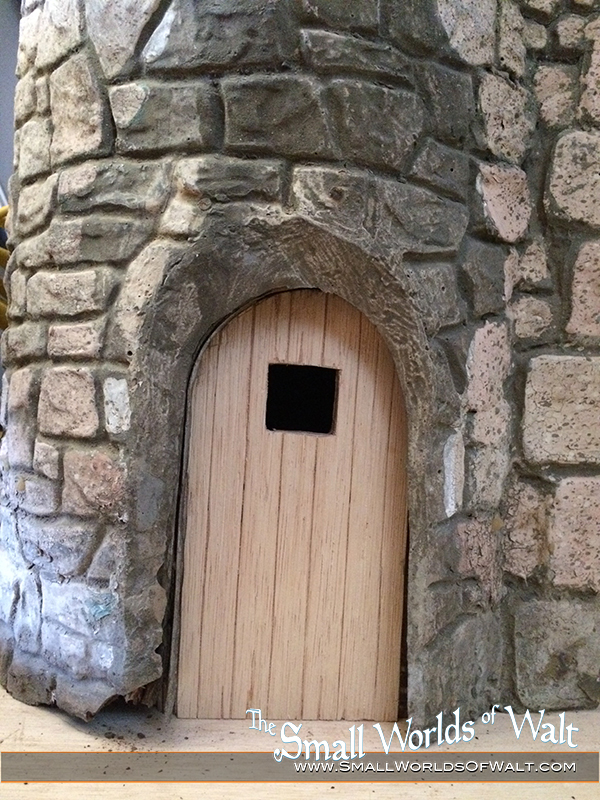 The window is cut out, this will eventually have a resin window that will be illuminated from within the Tower Gate. One whole layer of the plywood is removed around the door. 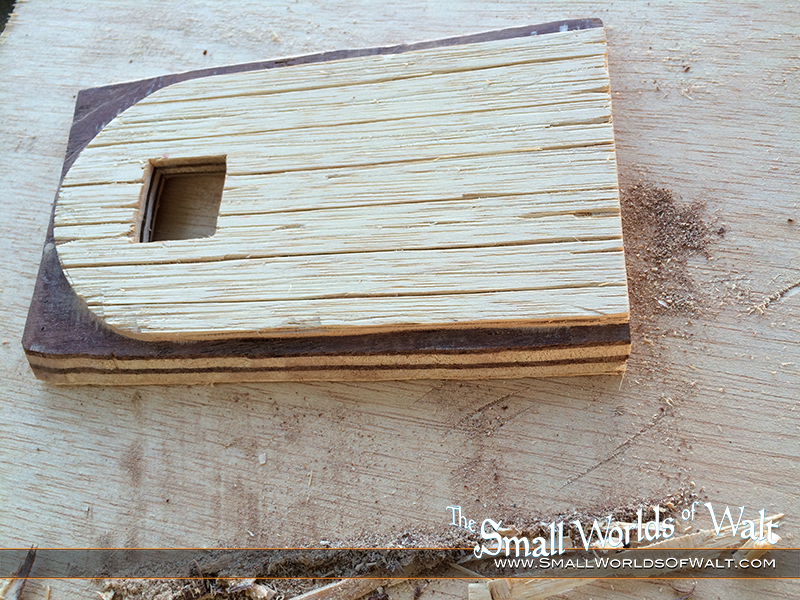 The planks that make up to door are carved out. 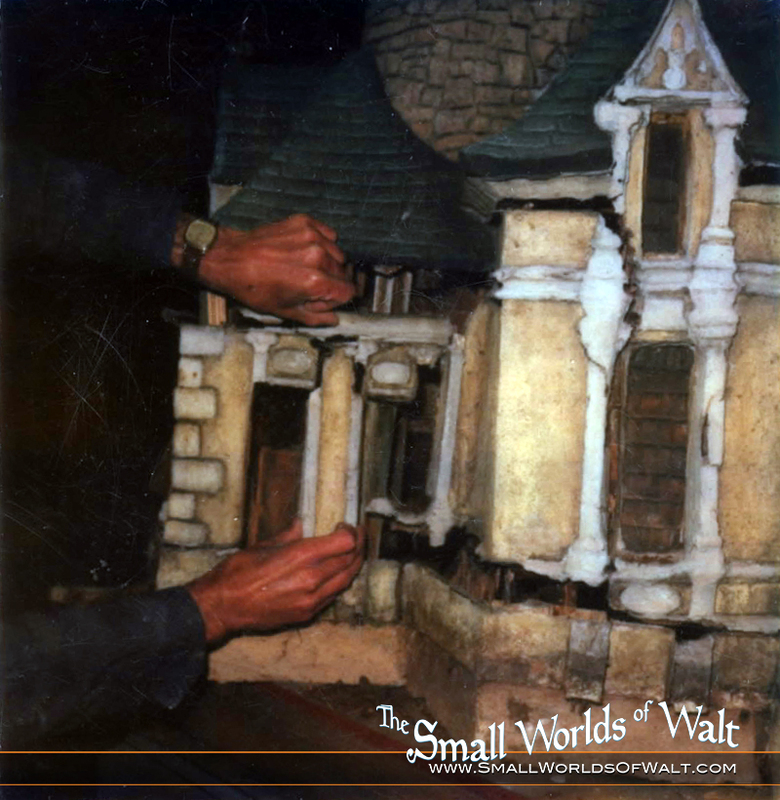 A wire brush is used to create the look of miniature wood grain, a technique used by the imagineers when the French Village was constructed! The final carved door, ready for painting! Published on August 13, 2015,	by Rob Fendler in Uncategorized. After a lengthily hiatus, we’re finally back! 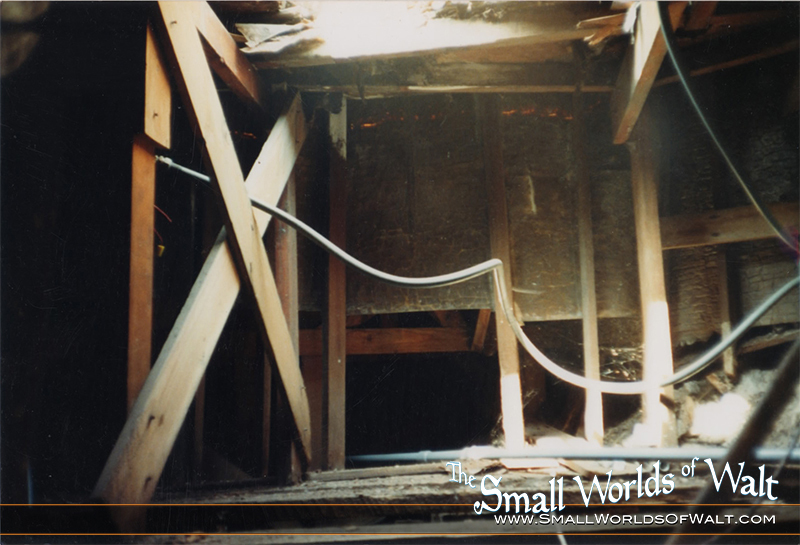 A cascade of events occurred that started with the discovery of termite damage at the house where the restoration is taking place which then to a full house renovation, which then lead to cutting the power to the workshop. But now we’re back up and running and can ramp up to regular updates. 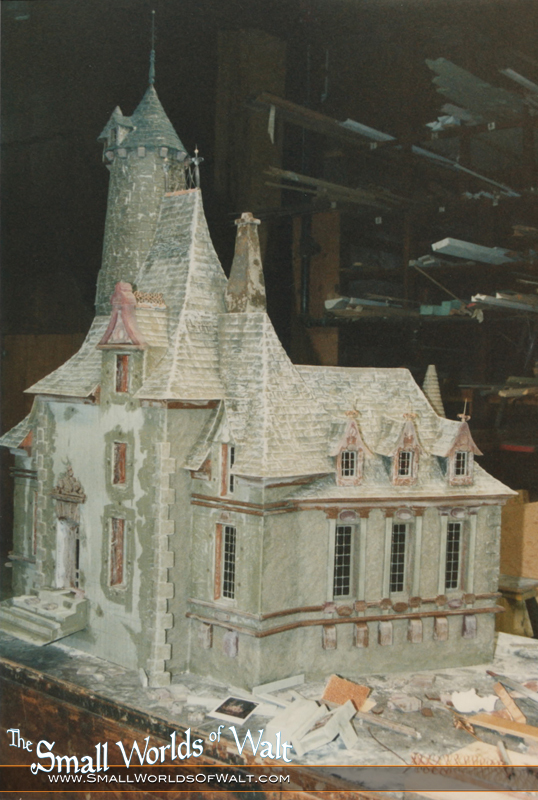 Rest assured, all funds that have been raised for the Storybook Land restoration are still intact and earmarked in the Carolwood Foundation treasury, awaiting the restoration. Updates may be slow since work is still being carried out in the off hours (which are no longer taken up by the house renovation) Thanks for your patience! Published on May 9, 2014,	by Rob Fendler in Fundraiser. Prototypes for the donor pins have arrived! The base metal on the final versions will be gold-colored instead of silver, like what’s shown here. The proofs were accidentally cast in the wrong metal. This gives you a good idea of what they’ll look like though. Published on December 6, 2013,	by Rob Fendler in Storybook Land. 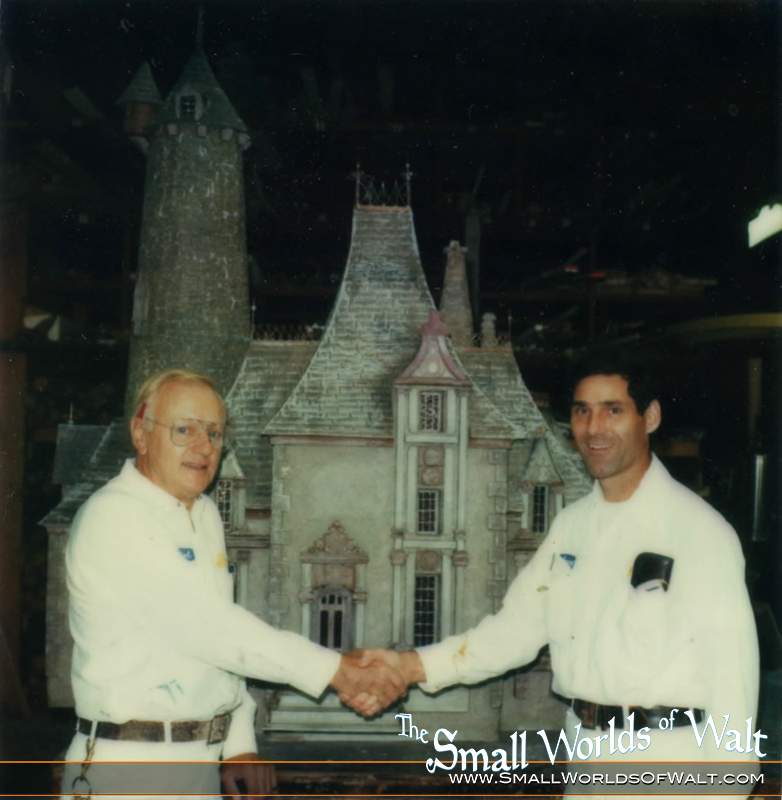 This next installment will be focusing on the French Village, the very same village that we at the Carolwood Foundation are seeking funding to restore and display. 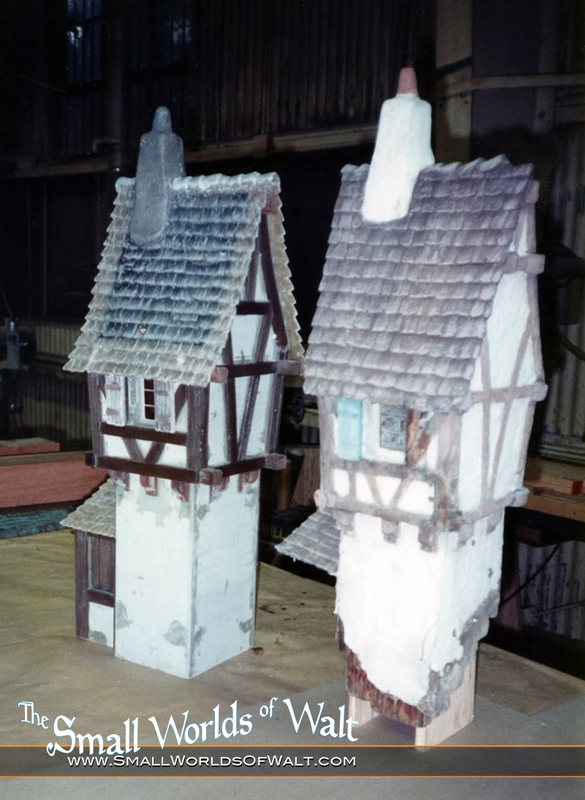 The following images may be painful to see, but it illustrates how these buildings were removed from the banks of Storybook Land in 1981 and eventually ending up in our hands. The original French Village, one final picture before they’re pried from their foundations. 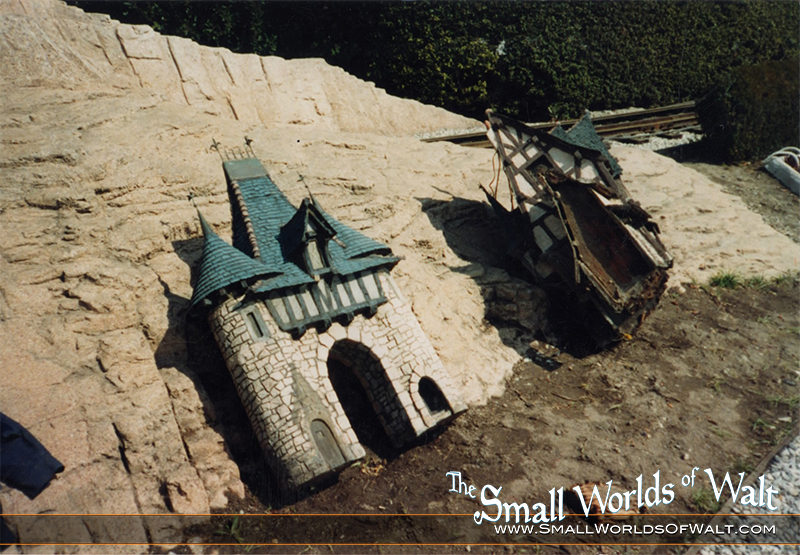 With the structures removed, a gaping hole into the deep underground realm of Storybook Land is revealed. What’s down there you ask? The most spiderwebs Jerry Parker had ever seen! This is the support structure for the rock wall that surrounds the French Village. I bet you never knew it was hollow! The exact buildings that we are trying to restore, laying next to the Casey Jr. track before being transported back to the Staff Shop. Looking at these same buildings now and how they were removed, its clear why and when they were separated into four pieces. Only the Stair Tower remains after the entire French Village has been razed and a new foundation poured over the hole left behind. Some parts of the lower French Village didn’t survive their removal, making the surviving village we’re restoring that much more priceless. More casualties of the removal. 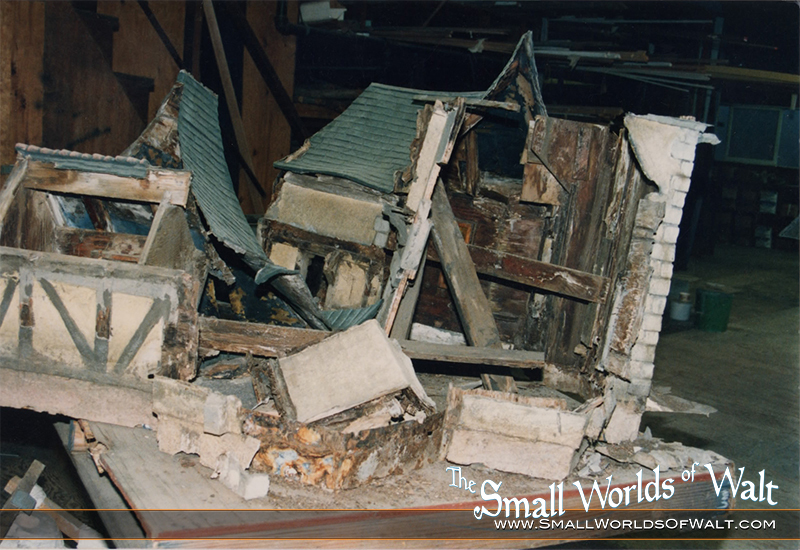 Among the rubble, you can spot the Stair Tower which was eventually salvaged in pieces and now on display in Walt’s Barn. The French Village, as it exists now. 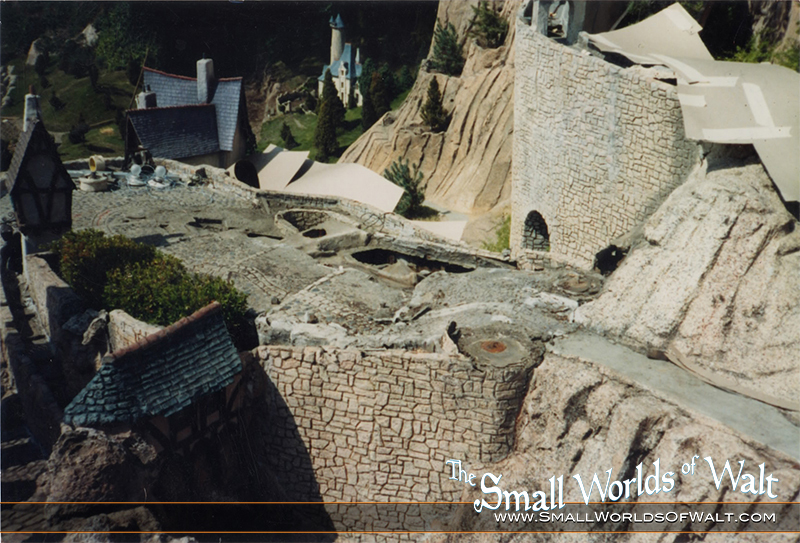 The only piece of the original Storybook Land that exists today. Its pretty amazing that its lasted all these years. 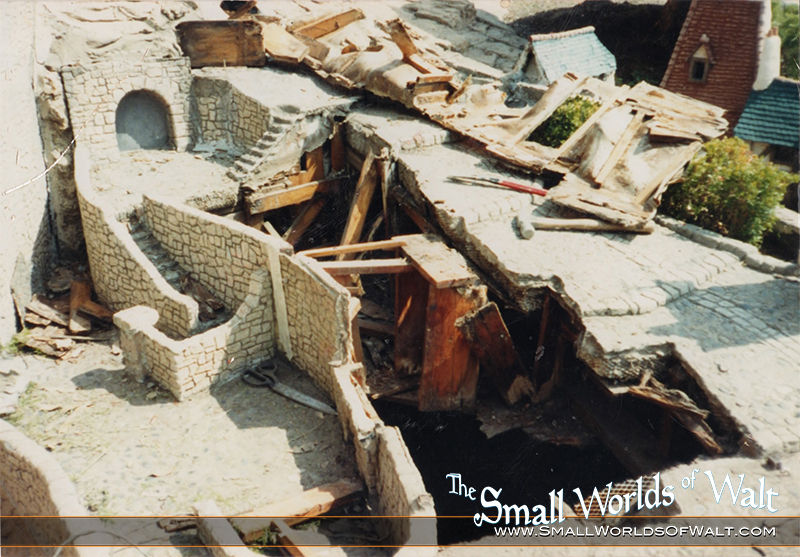 However, without restoration soon, it too will end up falling apart like the rest of the original houses of Storybook Land. 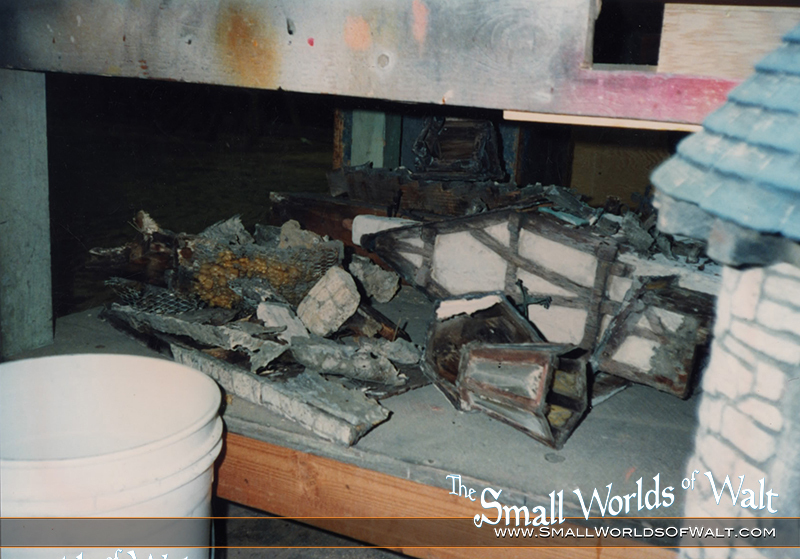 If you’ve enjoyed these amazing behind the scenes images of Storybook Land’s history, then I encourage you to help our efforts to preserve an actual piece of Storybook Land’s history. 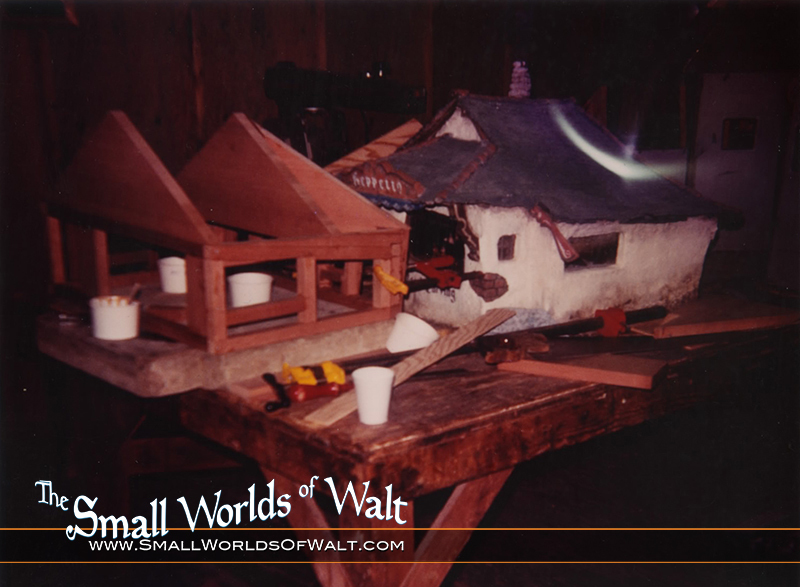 Your donation to our Indiegogo campaign will help us restore and display an entire original village that has survived from its removal in 1981 at Walt’s barn. 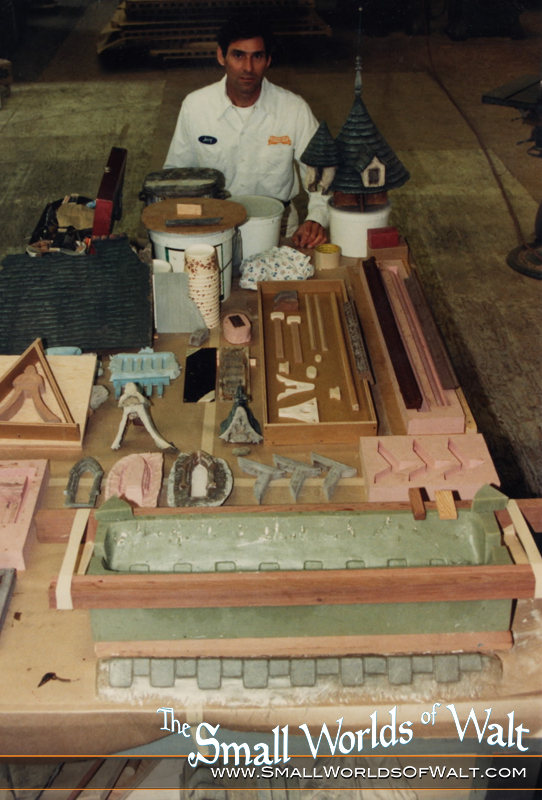 Please don’t let these priceless artifacts of Disneyland history go to waste. We can only do this with your help. Published on December 5, 2013,	by Rob Fendler in Storybook Land. 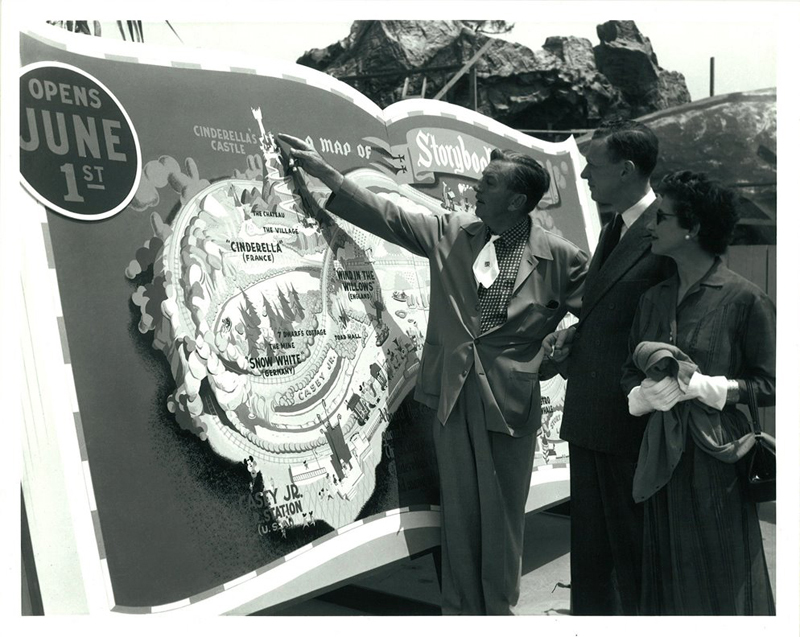 The forth installment of Gerald Parker’s Storybook Land rebuild process is the largest one yet, focusing on one of the largest structures in the attraction – second only to Cinderella’s Castle. 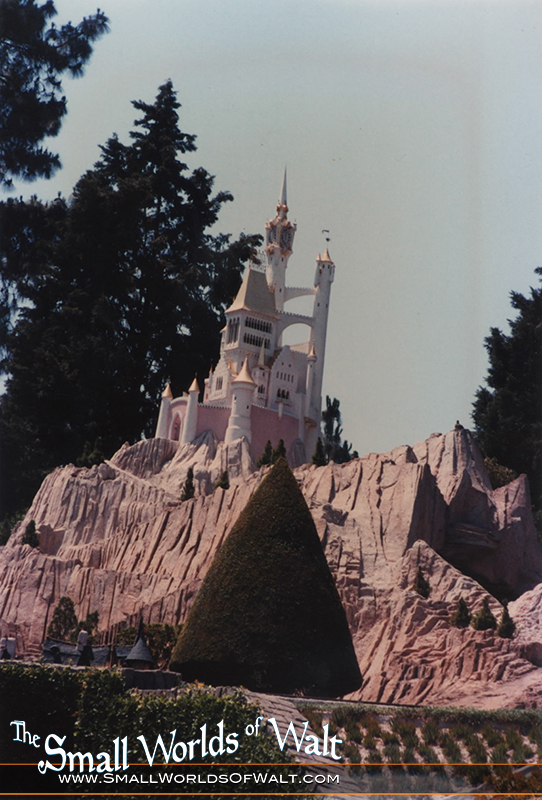 And that is the Tremaine house which sits at the base of the castle and features the tall tower where Cinderella was locked away from going to the ball. 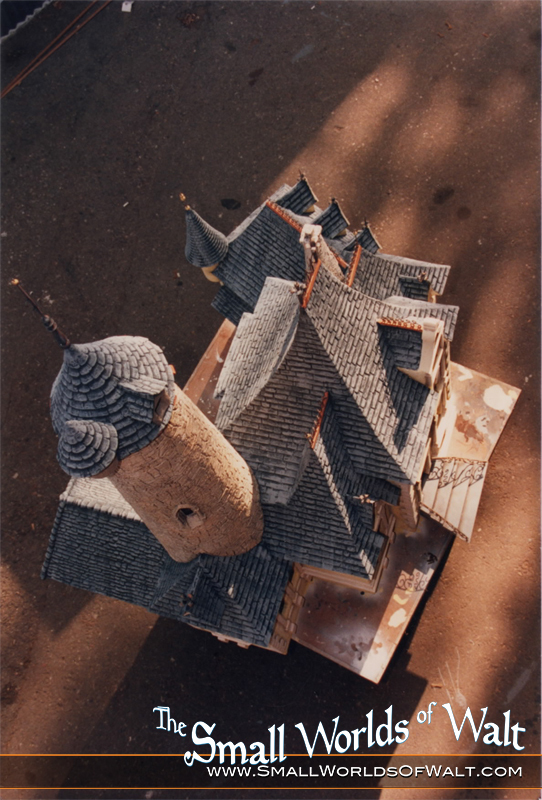 When the Chateau first arrived in the Staff Shop backstage after being crow-barred out of Storybook Land it was in pretty bad shape. One whole side of the house had collapsed and was delivered in pieces to the shop. Jerry Parker attempts to reassemble the chunks of Tremaine house so that accurate measurements could be made. No Prince Charming will be walking up these steps with a glass slipper any time soon. Even the windows had been completely covered up by years of repainting and quick fixes. Jerry with the framed out replacement constructed out of redwood sitting in front of the original house. Now clad in grey fiberglass board and the interior lighten installed. In order to create the stonework around the tower, a paper template is first wrapped around the surface. The template is then removed, giving them a guide for the stonework. 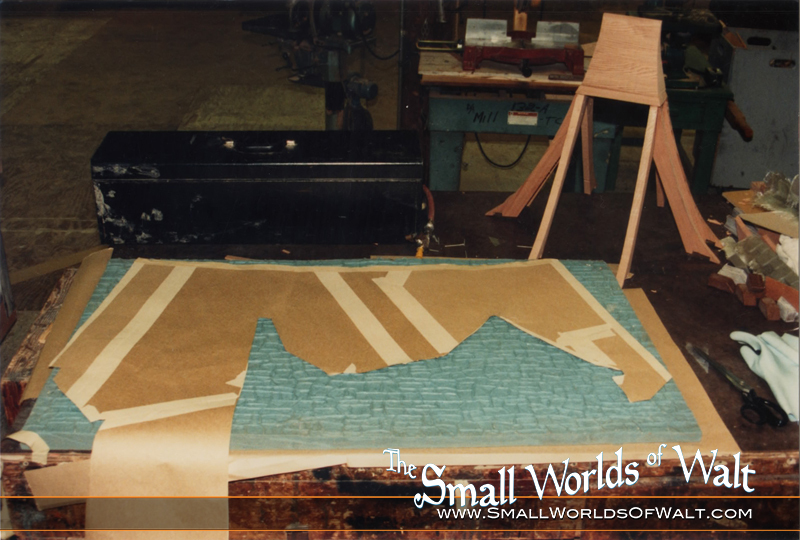 The template can then be used as a cookie cutter on a sheet of resin cast stonework that will be pulled from the blue silicone mold. Side by side comparison of the two Tremaine houses. 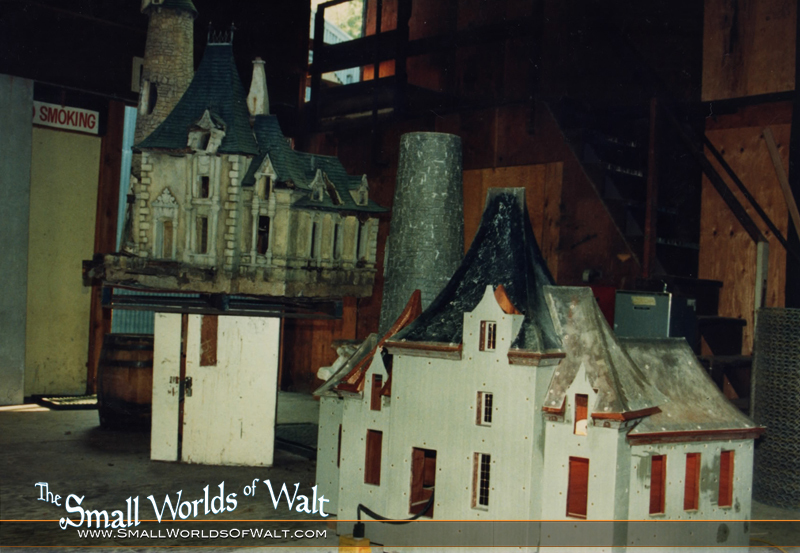 All the detail work that had to be remade for just the Tremaine house sits infront of Jerry. A single window with copper leading soldered over top held up by Will Graham. All the detail now applied to the exterior, with the copper widow’s walk and finials now being added. Graham and Parker adding in more details to the roof lines. Another miraculous save by Will Graham and Gerald Parker! Jerry adds the new front steps to the Chateau. Now Prince Charming will have no trouble at all navigating those steps! Now fully painted and ready to be installed, Jerry says goodbye to the Tremaine house. A rare downward shot of the chateau showing of just how truly enormous this building is! Published on December 3, 2013,	by Rob Fendler in Storybook Land. 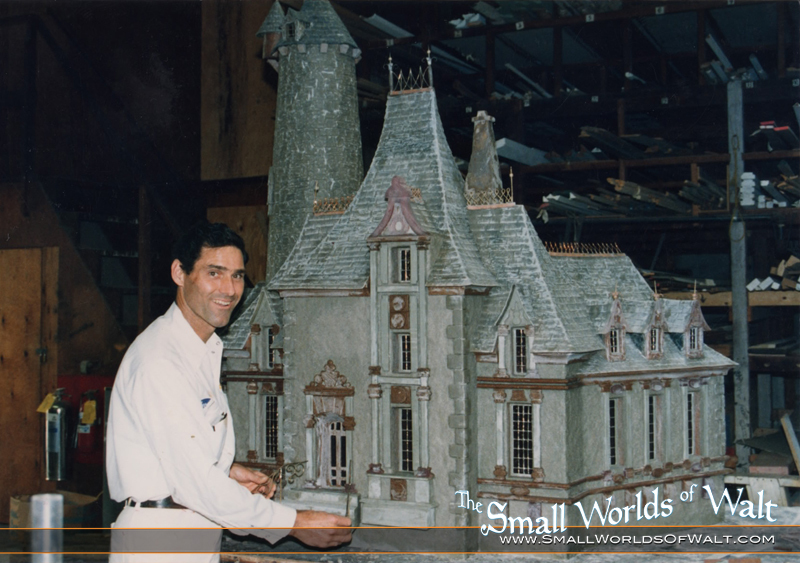 The Gerald Parker images continue this week with a incredible shot of Jerry standing next to his reconstructed Cinderella’s Castle. 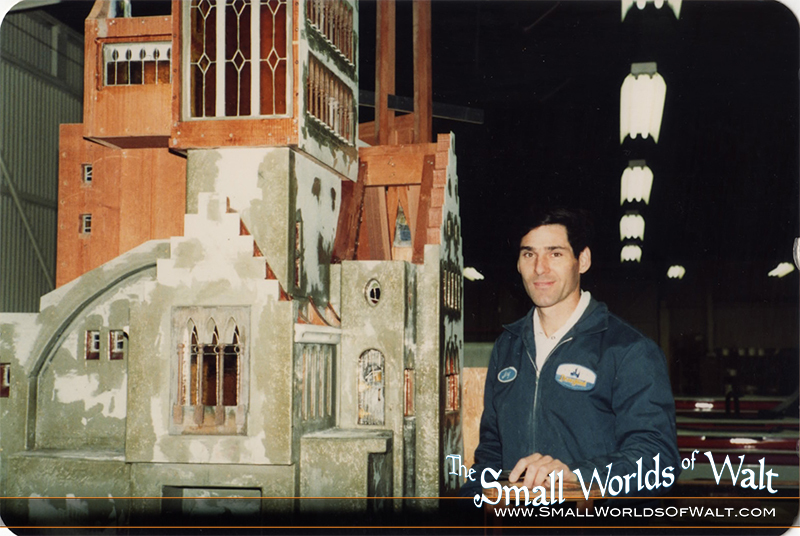 Compare this image with the final installed version of Jerry’s castle below and you’ll see just how large this “miniature” actually is! 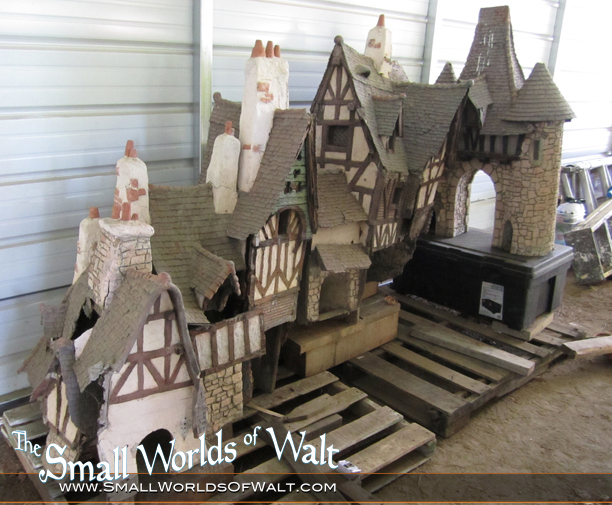 The story goes that after the original castle was built at WED in Glendale, in order to transport it down the freeway to Anaheim it had to be placed on its side to fit underneath the overpasses! 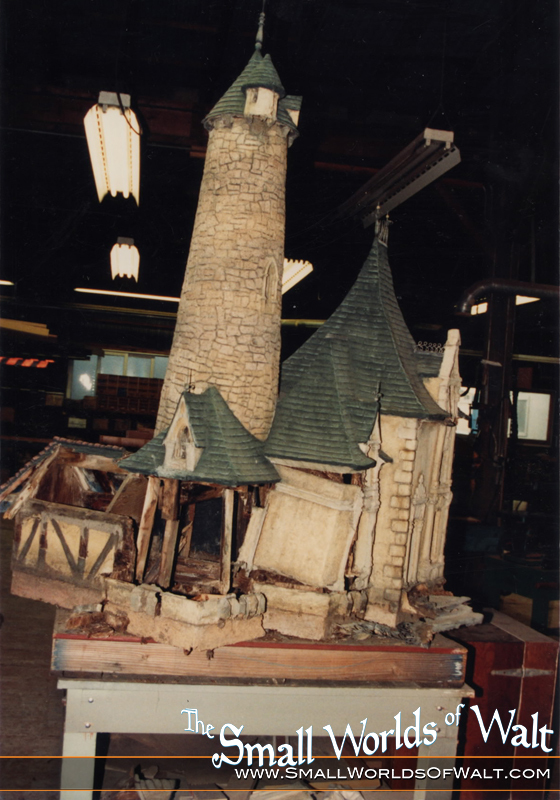 Luckily, the Staff Shop where Jerry built the replacement castle was located backstage, just a hop and a skip away behind Critter Country. Published on November 25, 2013,	by Rob Fendler in Storybook Land, Uncategorized. 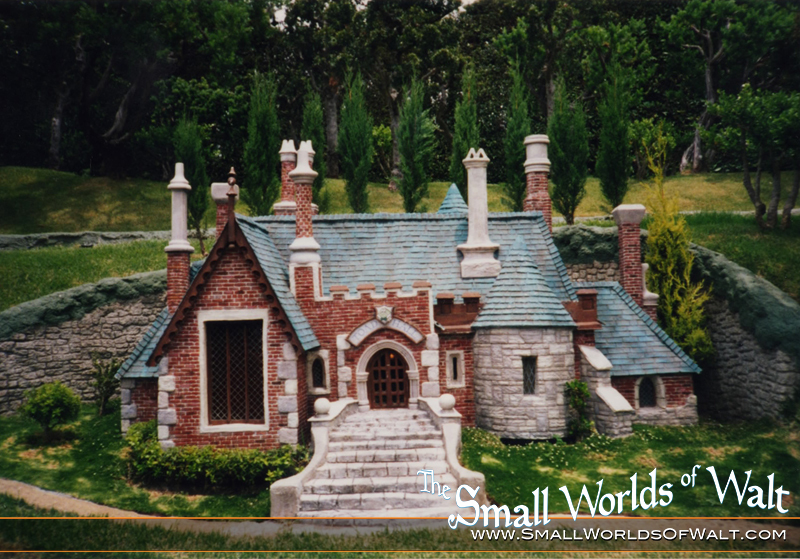 Continuing with the Gerald Parker series documenting the reconstruction of Storybook Land, this installment will focus on one of the most iconic structures of the entire attraction – Toad Hall. 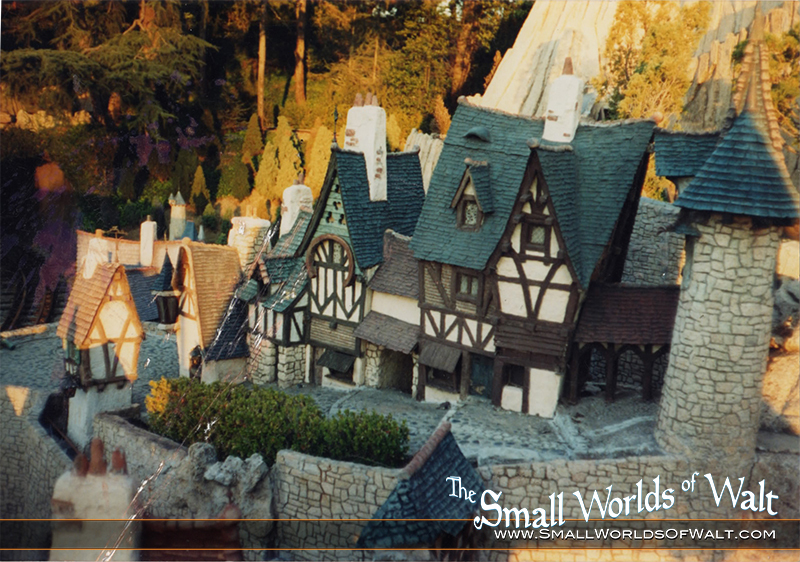 Originally sitting where Agrabah now resides, Toad Hall was such an enchanting design that when the new Fantasyland facades were being designed for Mr. Toad’s Wild Ride, the Storybook Land miniature was used as a template for the full-size ride building. 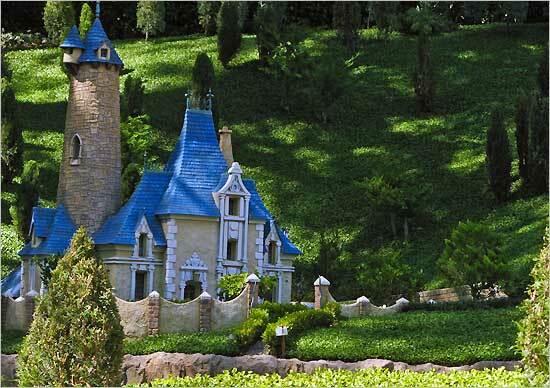 The original Toad Hall – Jerry remembered fondly just how many chimneys he had to rebuild on the new Toad Hall. 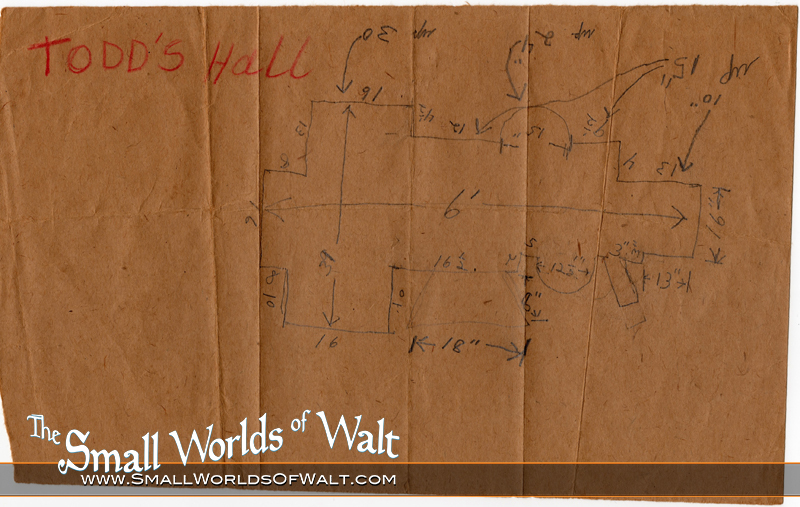 Jerry’s handwritten measurements taken out on Storybook Land before the old building was torn out. 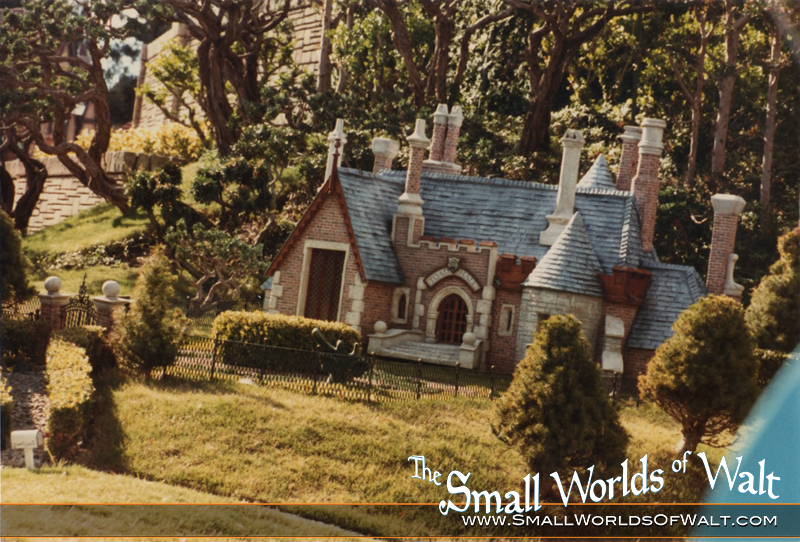 Yes, Toad Hall really is 6 feet wide! A rare look inside the interior of Toad Hall. Looking directly at the front door and large leaded glass window, the 12V Transformers for the lighting system can be seen in the lower right. 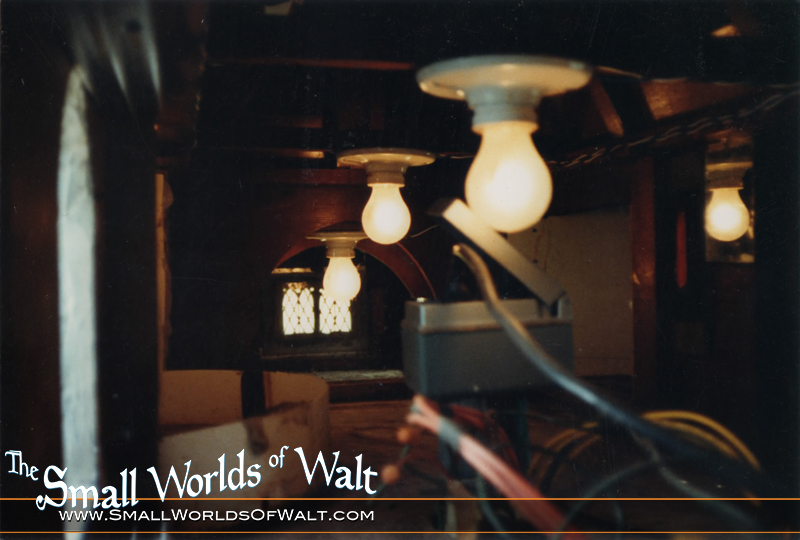 The new interior lighting system inside Toad Hall. Note the mirror on the right side of the image. Jerry figured out how to bounce the light around inside the building using mirrors so that every window would be lit up with the soft warm light. 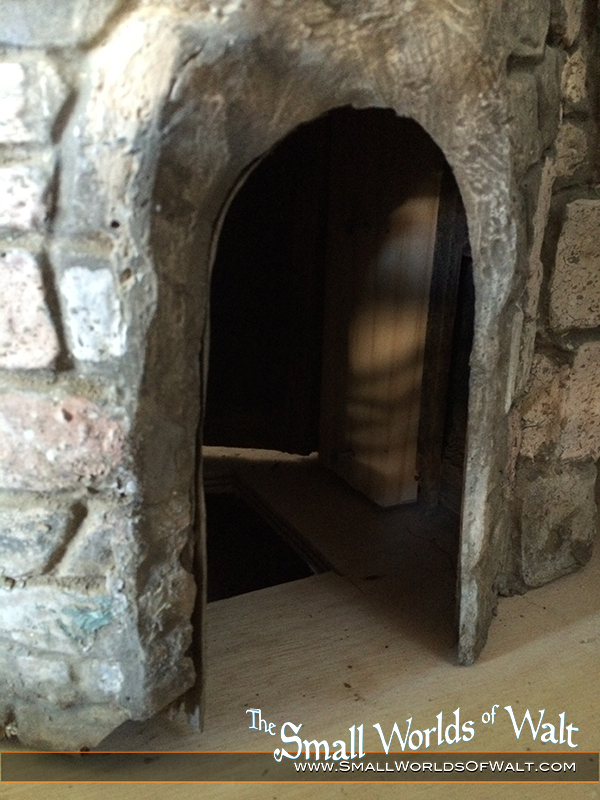 Jerry’s new Toad Hall, complete with its seven chimneys, now sits in its new location on the other side of the canal. 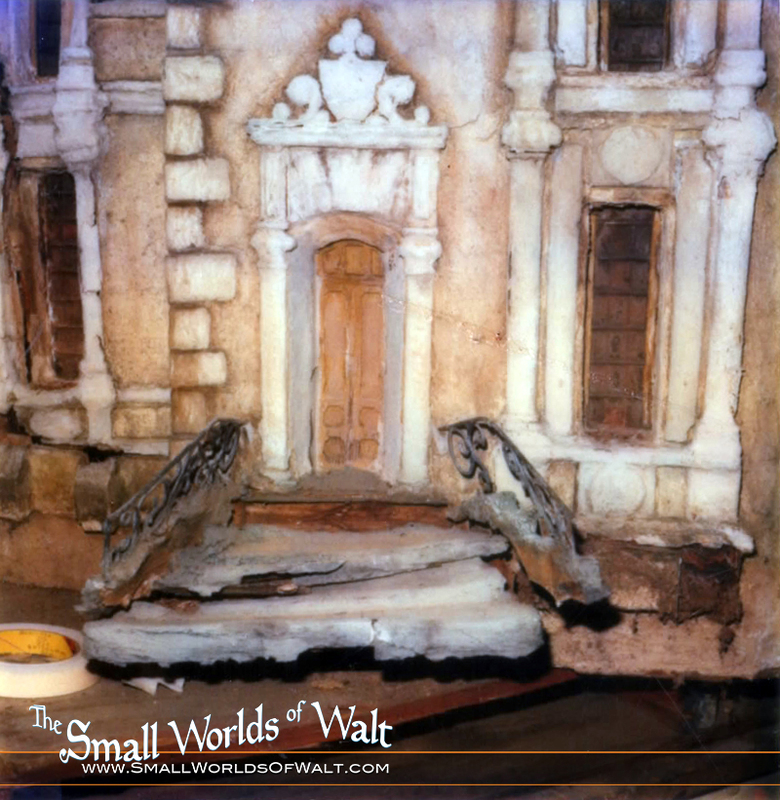 Published on November 21, 2013,	by Rob Fendler in Featured, Fundraiser, Storybook Land, The Small Worlds of Walt Exhibit. 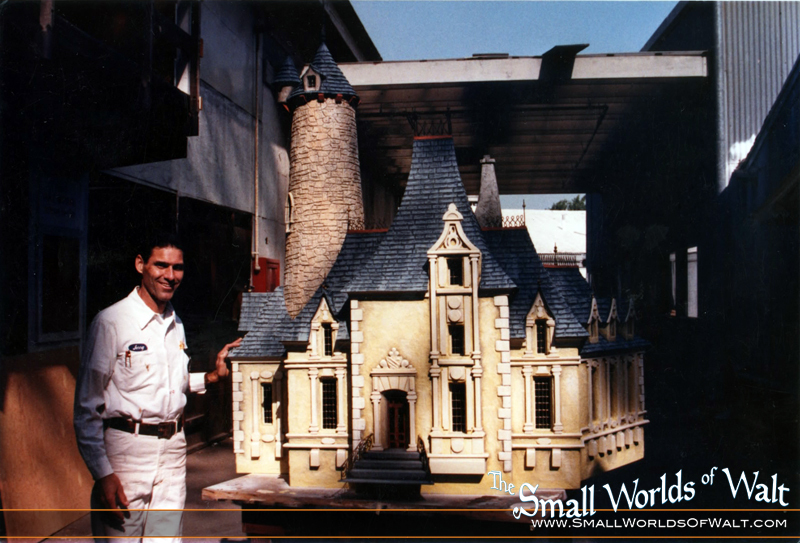 Gerald “Jerry” Parker of the Disneyland Staff Shop surrounded by his rebuilt Storybook Land miniatures. Just one month after installing the Stair Tower display in Walt’s Barn, Gerald Parker, retired 13 year veteran of the backstage Staff Shop who was taking his first trip to the barn stumbled upon the new display. It was something he thought he’d never see again. 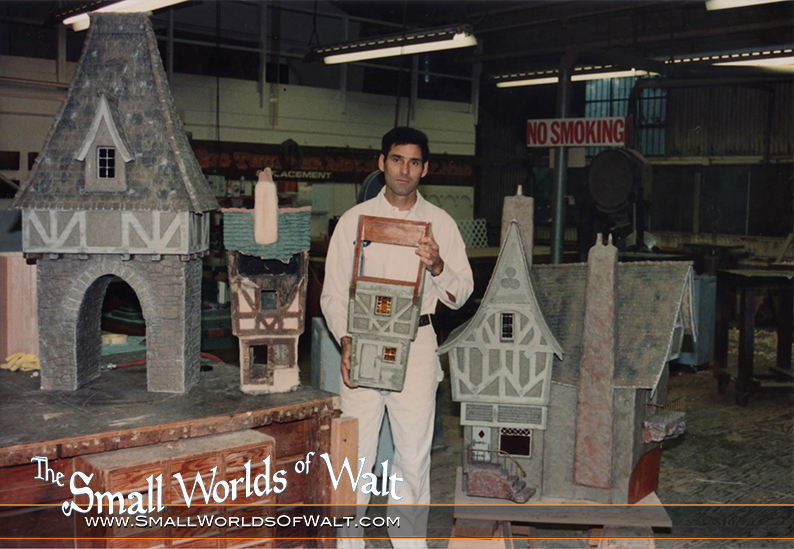 In 1981, Jerry was responsible recreating all of the Storybook Land miniatures which had nearly been destroyed by the elements and years of cosmetic fixes. 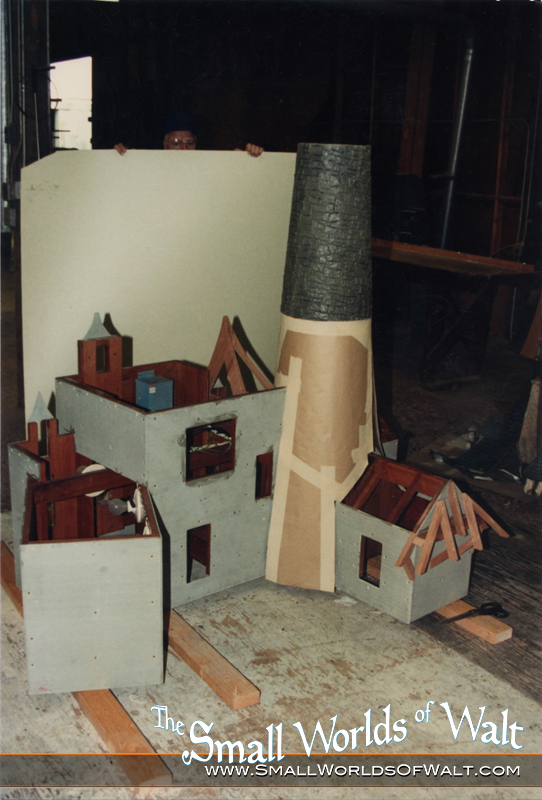 So when you visit Storybook Land now, every building you see from Toad Hall to Cinderella’s Castle and even the French Village, are all new models crafted by the Jerry and fellow carpenters Will Graham and Frank Babish. Jerry had no idea that we were mounting an effort to preserve the original French Village, and was very surprised that they even still existed! 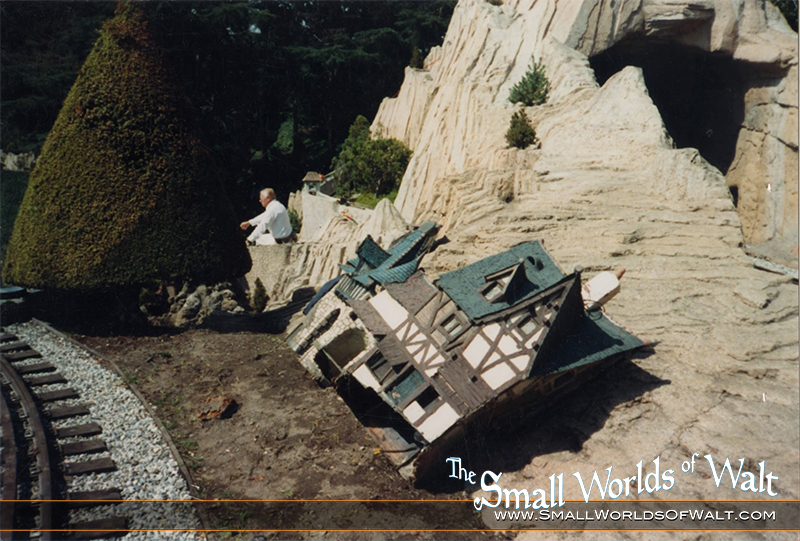 However, what blew us all away about this series of fortunate events was that Jerry owned volumes of photographs that he took to document the removal, recreation, and replacement of Storybook Land that took place from 1981-1983! 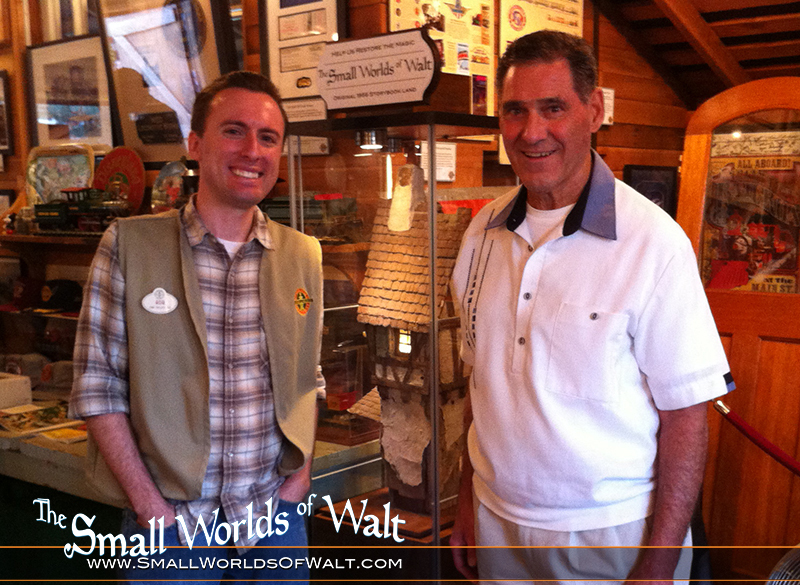 Rob Fendler and Gerald Parker with the original Stair Tower display in Walt’s Barn. At last month’s barn day, Jerry and his wife sat with me inside the Disneyland Railroad Combine car where I had set up my scanner. Together we poured through his photo albums that recounted his time at Disneyland. You couldn’t ask for a more patient and generous couple as the two of them sat with me as I documented Jerry’s personal story and the story behind each photo. They were surprised that I was so interested in his work and at the same time so happy to have been able to help me out with the restoration. Page after page of photos of the French Village floored me so many times that I think my jaw is still rolling around under the naugahyde seats of the Combine. Before now, all I had were a few images of the original village taken from the vantage points allowed from both Casey Jr. and the Canal Boats. But now, sitting in front of me were close-ups of the original village from every angle, heart-stopping images of the tear-out process, Polaroids noted with measurements, and snapshots of the old village sitting next to the new one. The missing link in Storybook Land’s history had been found. The amount of detailed woodwork throughout the Disneyland requires a full time staff responsible for repairing and replacing those details so that the average park guest will never know that they’ve been replaced. These replacement parts are carefully handcrafted in the Mill Annex, a backstage woodshop behind Critter Country that could provide on-the-spot replacement parts for whatever arrives in the shop in pieces. 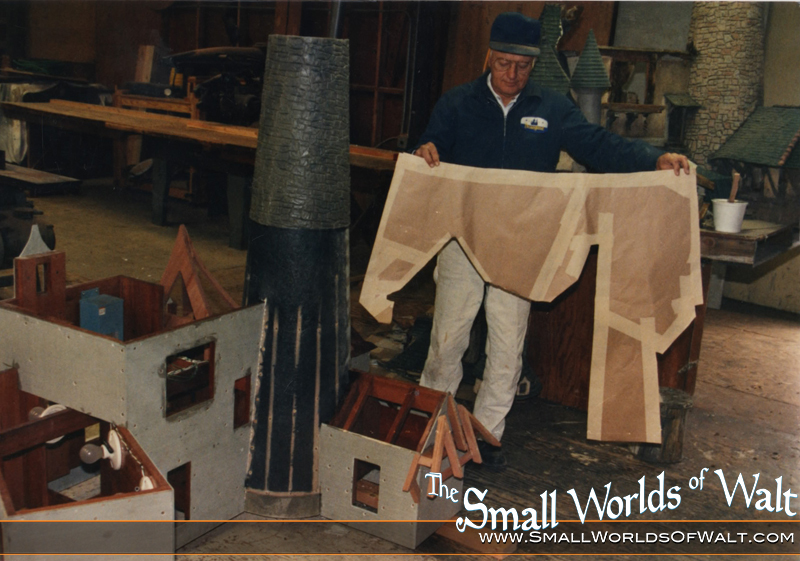 In 1979, Jerry landed a job in Disneyland’s Staff Shop because of his previous work for the Hollywood Wax Museum, and his experience with fiberglass and mold making. After proving himself to Staff Shop Supervisor, Don Crosby, Jerry was asked to take on a daunting task – rebuild all of Storybook Land. He told his superior, “This is beyond my abilities, but I will do my best. 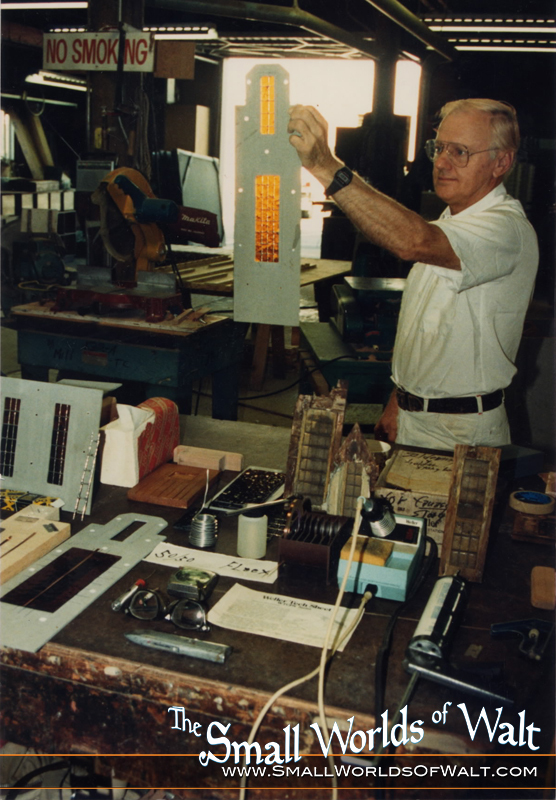 However, I’ll only do it on one condition: if this doesn’t work out, I get to go back to my work in the Staff Shop and I won’t hear another word of it.” His supervisor agreed and Jerry was presented with a crumbling Geppetto’s workshop. 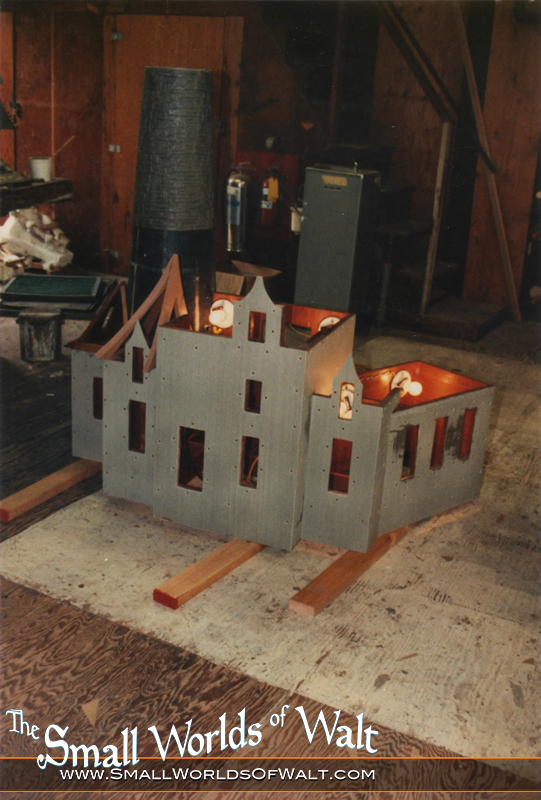 Jerry began creating a new miniature building from redwood and wrapping it in fiberglass board, improving on the original’s construction materials of marine plywood that had disintegrated over the years. Although unsure he could achieve the level of craftsmanship of Wathel Rogers, Fred Jeorger, and Harriet Burns, Jerry pressed on. 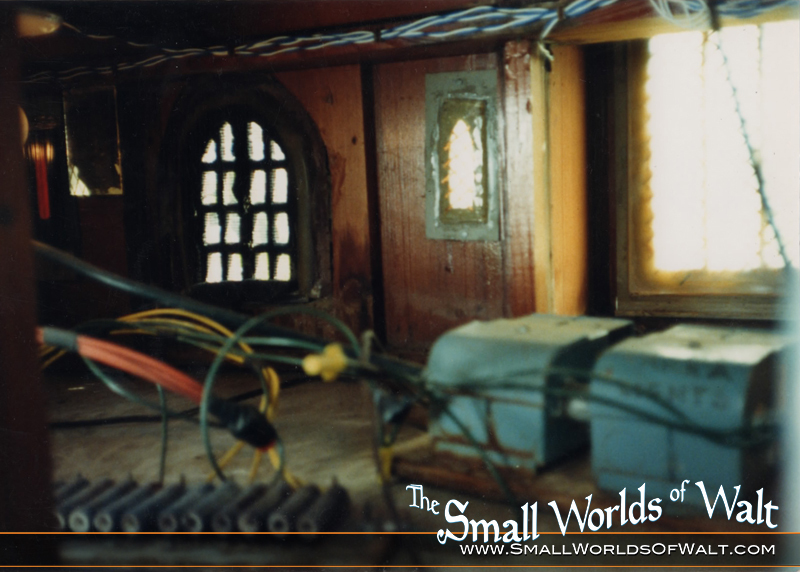 His finished Geppetto’s workshop was a success and it fit perfectly back into Pinocchio’s village. One building down, many more to go. The new building being constructed out of rot-resistant redwood next to the original Geppetto’s that been pulled out of the attraction. The exterior walls now clad in fiberglass board, the small details are added back in along with a newly cast fiberglass roof. The finished replacement getting final paint before being installed back into Storybook Land. 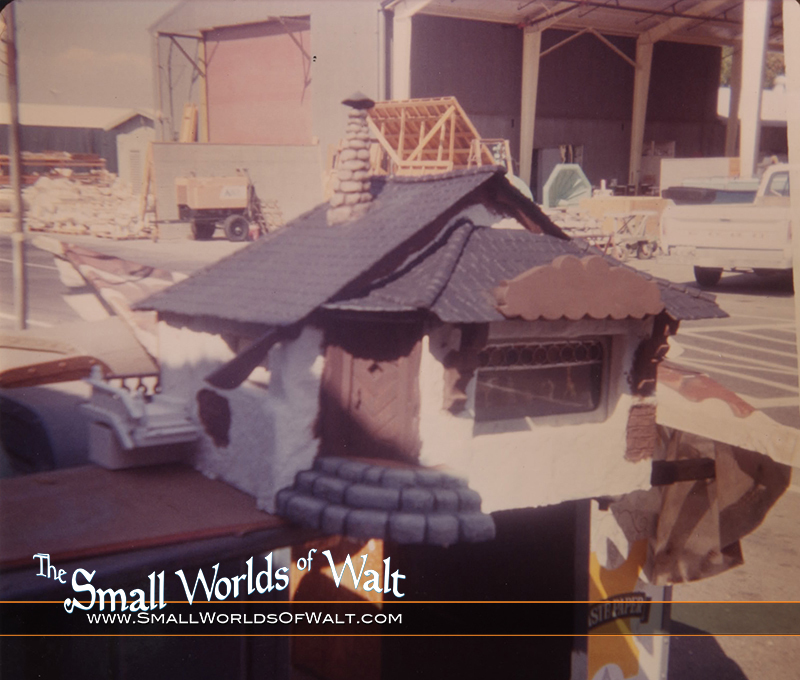 This is the first installment of many that will be exploring this rare behind the scenes look at the history of Storybook Land. 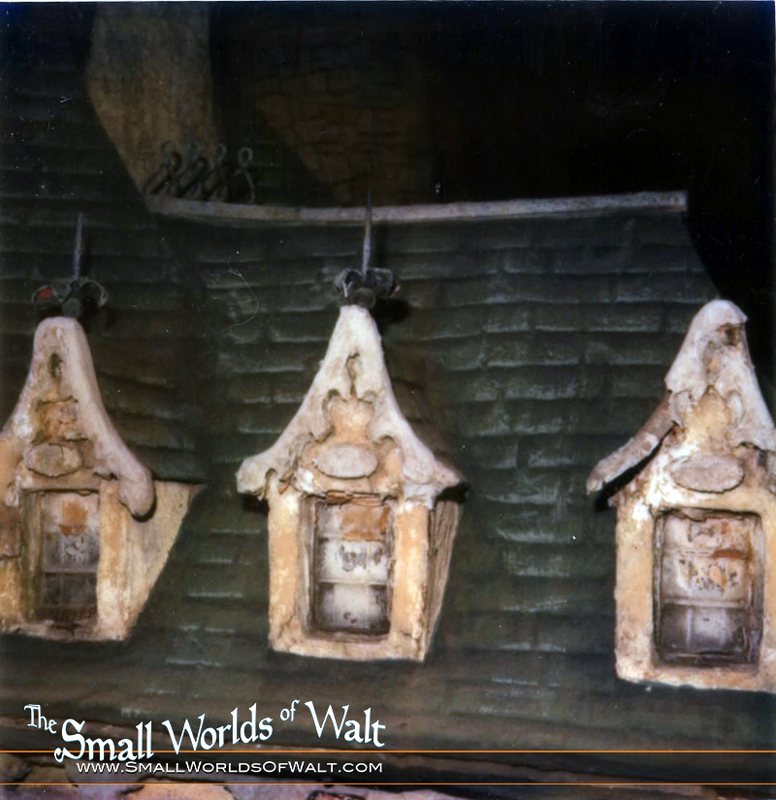 During these last few weeks of the Indiegogo Fundraiser to preserve a piece of the original Storybook Land, new installments of Jerry’s photos will be posted leading up to the Dec. 10th close of the fundraiser. 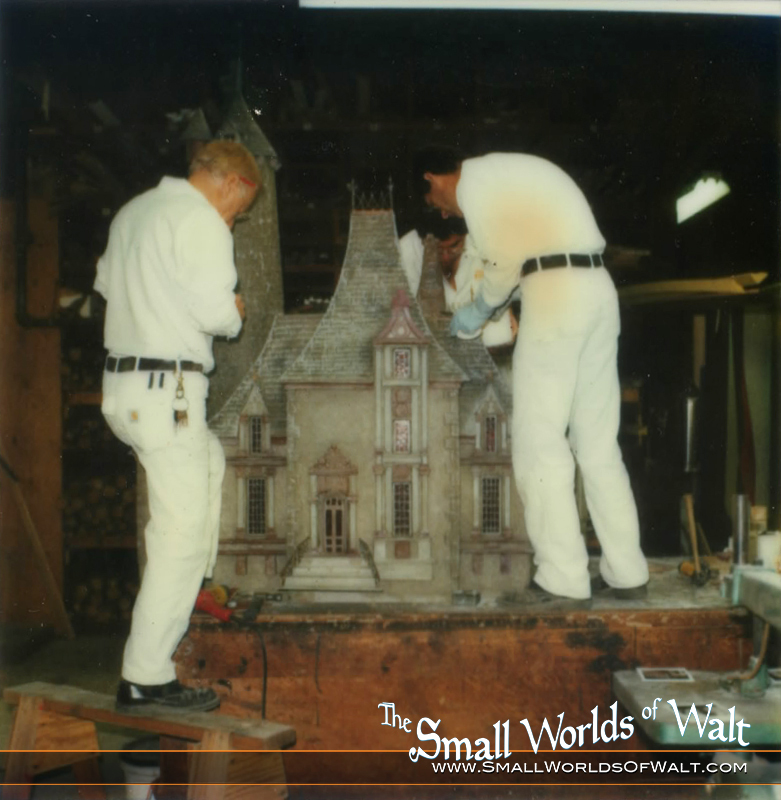 Check back soon; and if you can, please help us preserve a piece of Storybook Land history through our Indiegogo fundraiser. 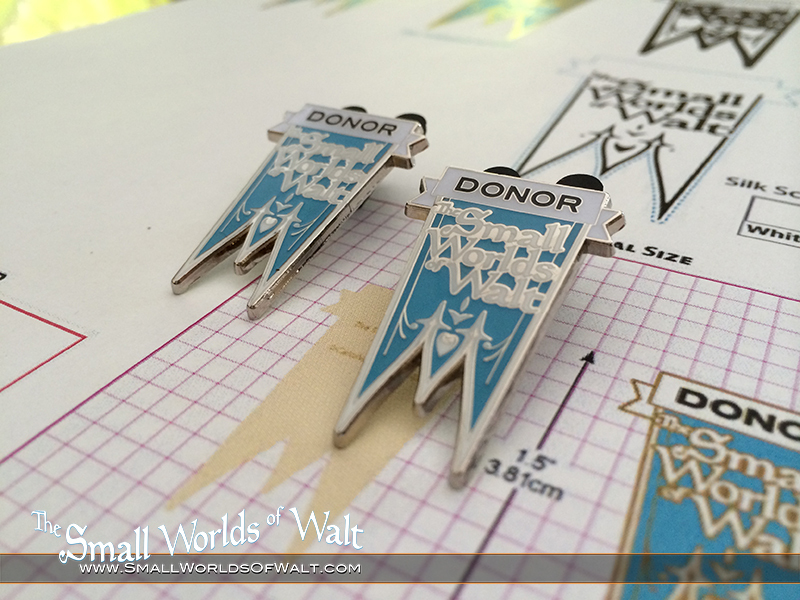 Make a $35 donation and receive an exclusive Small Worlds of Walt Donor Pin. 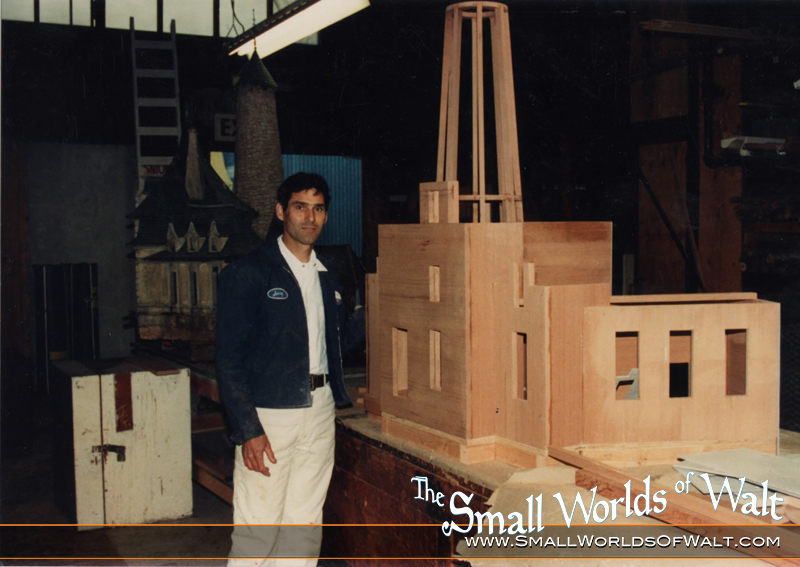 Carolwood Foundation – Small Worlds of Walt - Preserving Stair Tower on Back to Life! 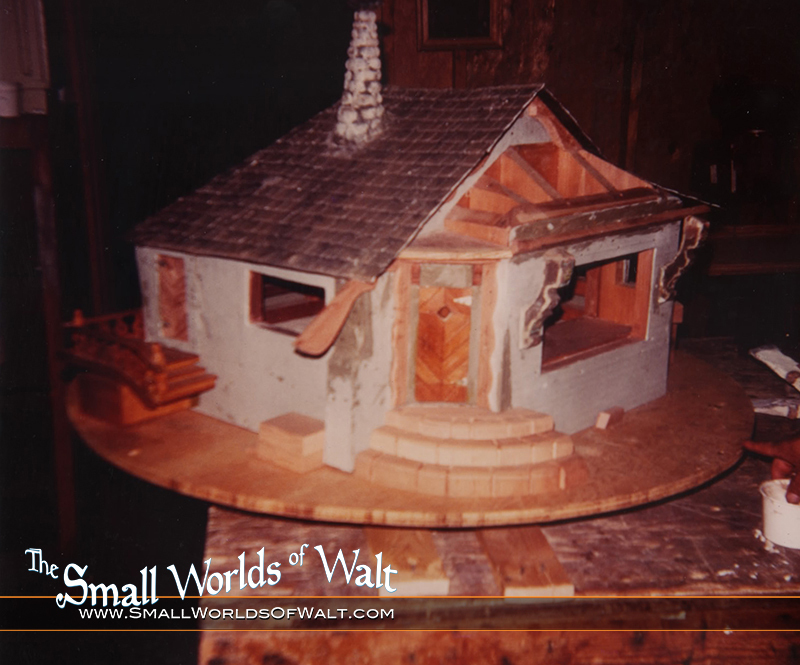 Carolwood Foundation – Small Worlds of Walt - Help Restore the Magic! on Donation Reward added! The Carolwood Foundation is a 501c3 non-profit organization.